HUGE, Bug-Eaten Sycamore Leaf- Look at the Detail! Size: Sycamore Leaf is 6.5 inches long! Here is an extremely impressive fossil leaf. This is a spectacular Macginitiea wyomingensis Sycamore Leaf from the Green River Formation of Utah. All five lobes of the leaf are present, with half of one lobe showing distinct insect feeding damage! That lobe has been eaten away by a bug prior to fossilization - leaves that show insect damage are quite unusual in the fossil record and very desirable to collectors. The serrrated margins are exhibited in wonderful fashion, the venation of the leaf is very easily seen, and the LONG, complete petiole is still tightly attached to the leaf. The dark brown leaf contrasts beautifully with the khaki-colored matrix. 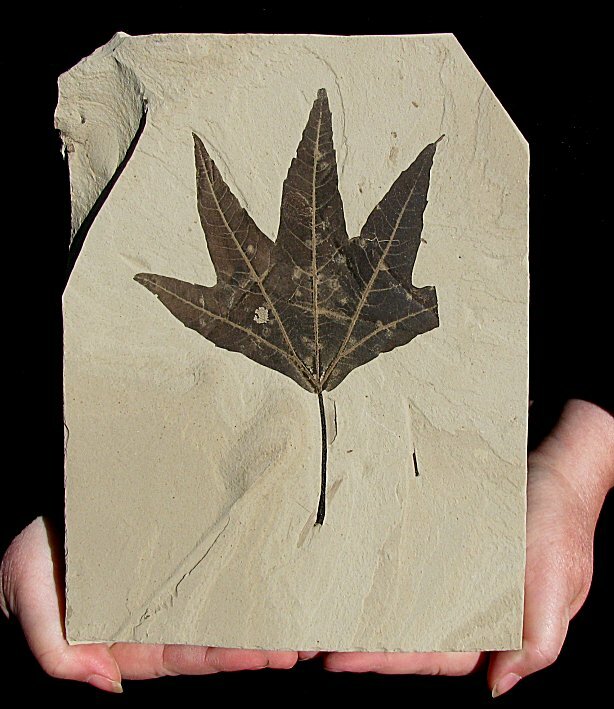 The amazing plant fossil is quite striking and extremely well showcased on the semi-squared plate of shale. This is a top quality display example of a large, bug-eaten Sycamore leaf that shows ancient predation.